Hosta Sports Hosta Reversions | What Is Wrong With My Hosta? What is wrong with my hosta? Why does some of the clump look different from the rest? What are hosta sports? What is a reversion? Here is a technical definition of a sport and a reversion. Sport: An individual arising from the result of mutation, chimeral rearrangement, or mitotic recombination that is genotypically or phenotypically different from the original individual. Reversion: (in Hosta) The change of a variegated sport back to its original solid color predecessor. So what does that mean in layman’s terms? A sport is a leaf bud in a clump of hosta that grows differently than the rest of the clump. See the green growing in the clump of ‘Guacamole’ in the picture to the right. 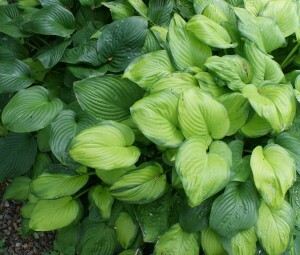 The green is not a reversion because ‘Guacamole’ is actually a hosta sport of ‘Fragrant Bouquet’. There are different types of sports as noted below. Mutation: A genetic change of DNA of an individual. Chimeral Rearrangement: (in Hosta) Changing position of the cells between different tissue layers in an individual, i.e., a gold-margined hosta producing a gold-centered, all-green, or all-gold division. Mitotic Recombination: A change in the genetic make-up or physical appearance. So What Do We Do With a Hosta Sport or Reversion? Both should be removed by using a knife and cutting the bud off of the clump. 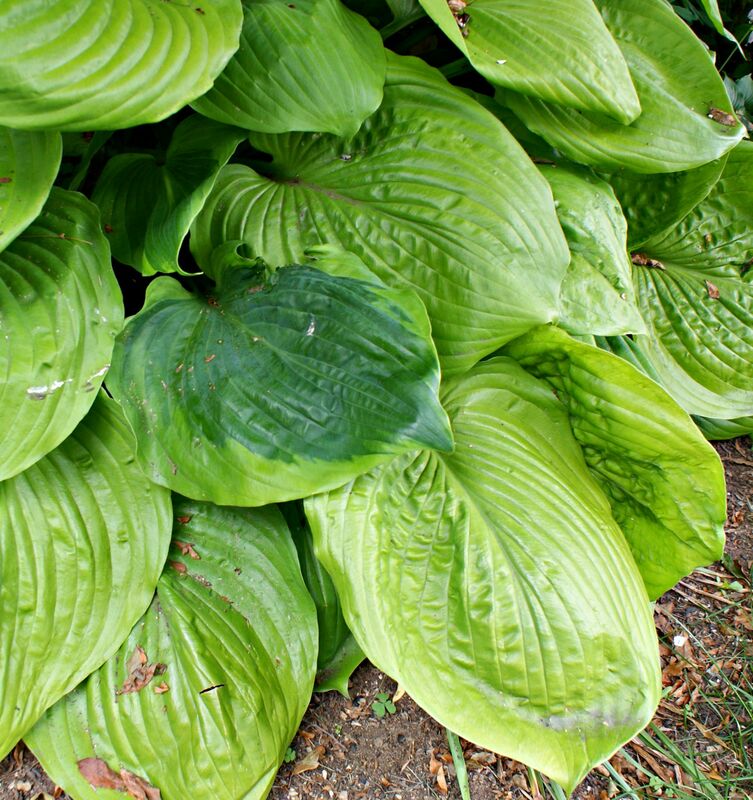 The best way to do this would be to lift the whole hosta and separate all the unwanted divisions, then reset the original hosta. These hosta sports and reversions can be kept if they are wanted and grown somewhere else in the garden.